Mino-akking, Mahn-a-waukke: What's the Origin of the Word 'Milwaukee'? Our Bubbler Talk question for this week comes from Hannah Kaytonah, a student at Mount Mary University: "I’ve always wanted to know where the word Milwaukee comes from." To find the answer to that question, we have to go back in time hundreds of years to a Milwaukee with no tall buildings or criss-crossing streets congested with traffic. "It would have been pretty much a wilderness, and life would have been hard," Milwaukee historian John Gurda says. "It would have been like camping all the time, and not just in the warm months of summer. It was twelve months a year." 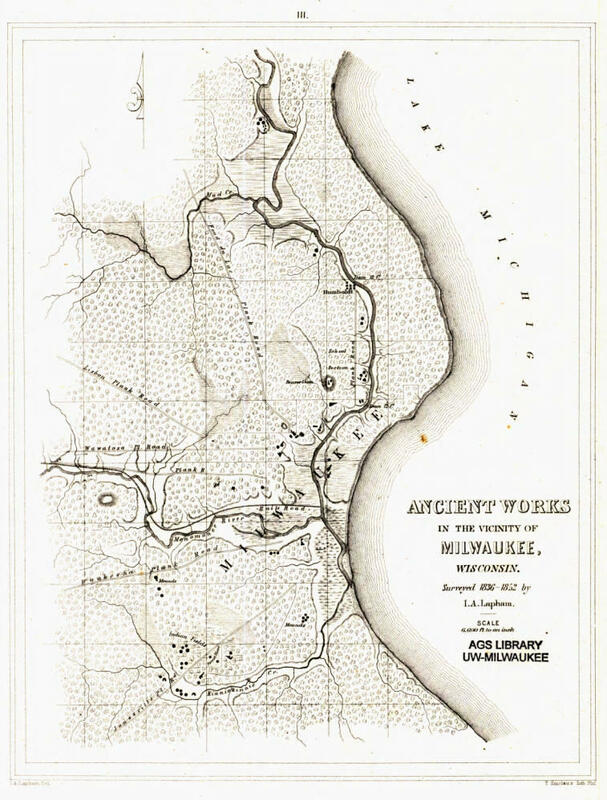 Ancient works in the vicinity of Milwaukee, Wisconsin, surveyed in 1836-1852. 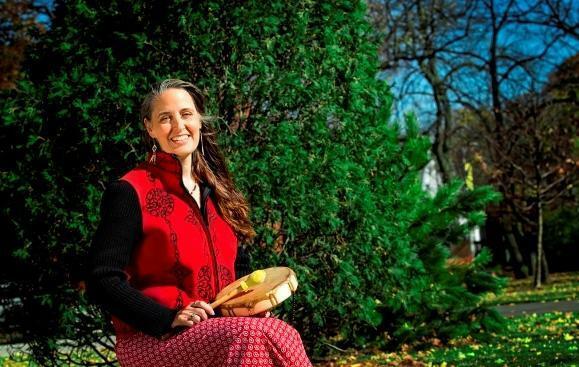 Despite the hardships, the Milwaukee of centuries past had a vibrant, culturally rich population of indigenous people who formed several tribes, including the Menominee, Potawatomi, Ojibwe and the Ho-Chunk, Gurda says. "There were at least seven villages within about two miles of Milwaukee’s downtown," he explains. 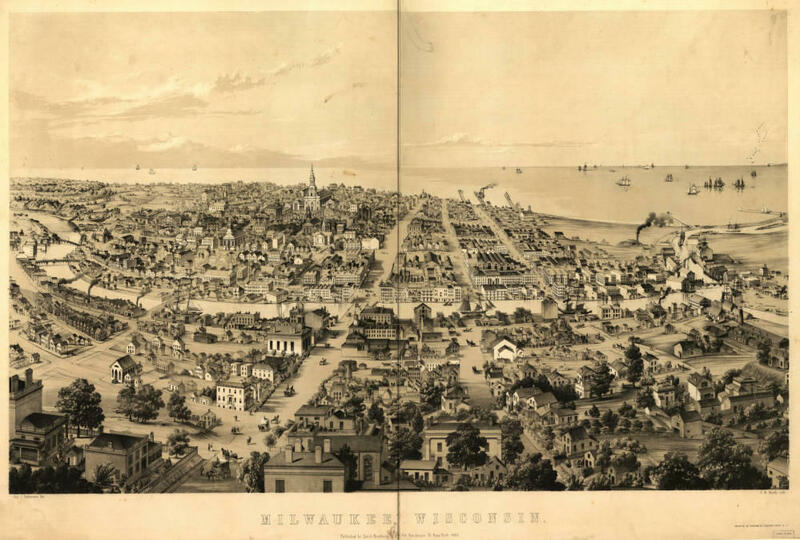 "And they were right in the heart of downtown - as far west as 24th Street, down to Walker’s Point, down in Bay View, and they all had easy access to the Menominee River, the Kinnikinnick, and Lake Michigan." The southeast Wisconsin that was home to the tribes, known as the People of the Three Fires, was wild and lush. The people who lived here farmed, hunted, traded in complex networks across the country, and generally thrived. The place where Milwaukee stands today was a destination, even then, for all kinds of indigenous people to meet, talk, negotiate and celebrate. So whatever they called this place, the name certainly reflected at least some of that. Survey of the entrance to Milwaukie, Wisconsin, 1836. Noodin says documents of the time period lead her to believe the original name for Milwaukee was a word from that language - Mino-akking, which means "good earth or good land." However, Noodin says there is a second, similar sounding word from a different native language that is a contender as the word that would become Milwaukee. "Mino-akking,... the Anishinaabemowin version, I think is the closer term," she explains. "But people will often remember Mahn-a-waukke, which is the Meskwaki term." The Meskwaki word means “the gathering place,” which this area clearly was. Dr. Margaret Noodin, Director of the Electa Quinney Institute, and an Assistant Professor of English and American Indian Studies at the University of Wisconsin-Milwaukee. 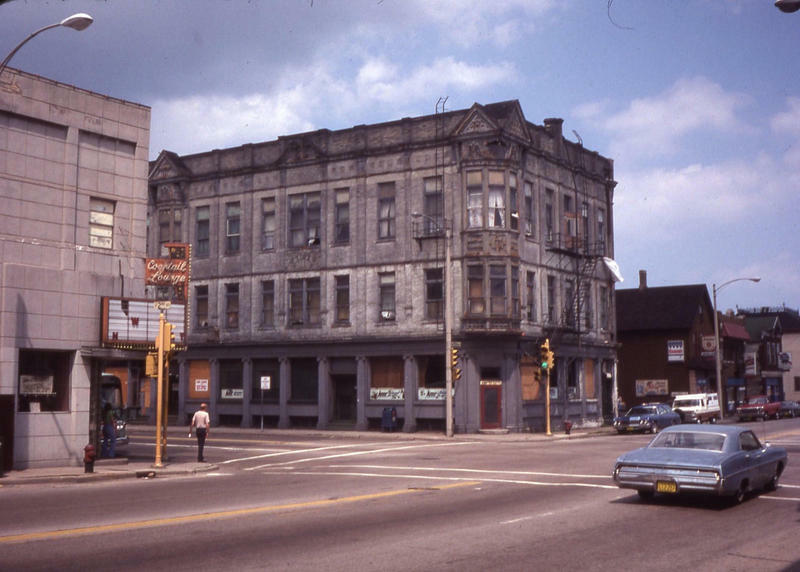 Historian John Gurda says there was likely a gathering place for the seven villages in and around what is now Milwaukee, probably right here - where you find WUWM at Water and Wisconsin. Noodin says, however, "good land" remains her odds-on favorite, because Meskwaki place names are uncommon in this area. "In a place where you’ve got Ozaukee County, Chicago to the south, Kenosha, Wauwatosa, why on earth would you have just one city name that is not in those languages. It’s randomly Meskwaki, you know what I mean?" So, while there’s a decent case for the gathering place, Noodin says when looking at all the evidence, the precursor to the word Milwaukee was most likely from the vocabulary of the Odawa, Potowatami and Ojibwe tribes meaning the good land. Our questioner, Hannah, says both options fit. "A gathering place and a good place…a good place to gather!" The music used in this story was performed by Dr. Margaret Noodin and her hand drum group, Miskwaasining Nagamojig. 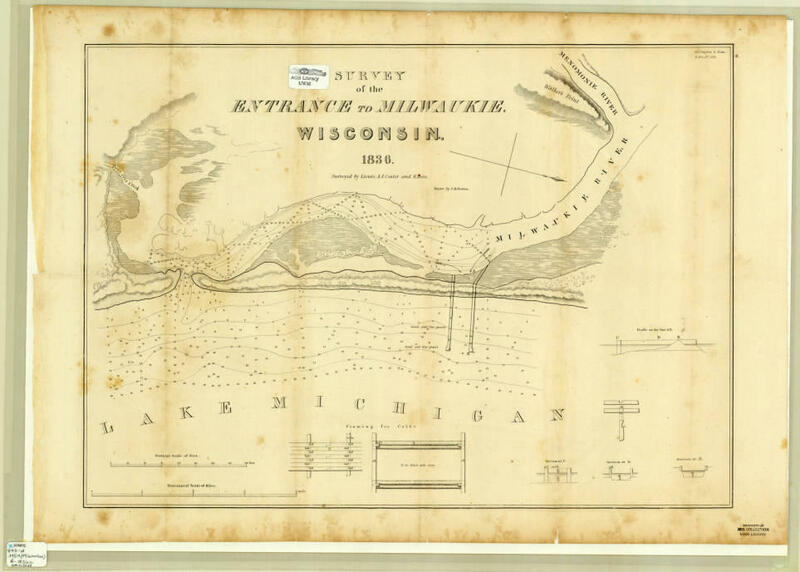 Historic maps courtesy of the UWM Libraries American Geographical Society Library. This week's Bubbler Talk question comes from Jim Thompson, who teaches mechanical drawing at MATC. "I saw on a map there were two Honey Creeks in Milwaukee. One’s down close to the [Kinnickinnic River], and the other is up by the Menomonee [River] in Wauwatosa. And I was wondering if they’re just one stream or two separate streams." Before we searched for the answer, we were curious why Jim wanted to know: "I happened to be putting together a jigsaw puzzle…"
To kick off the new season of Bubbler Talk, we’re going to revisit a question we pursued last year, from listener Patricia Mousseau. She asked: Why can’t the clock tower at the corner of North Avenue and Prospect Avenue keep good time? Patricia was right: the clock’s three different faces each showed a different time – and only one was accurate. A weekend brunch staple: the Bloody Mary. The vodka and tomato juice drink has become known for its garnishes, which tower over other cocktails. 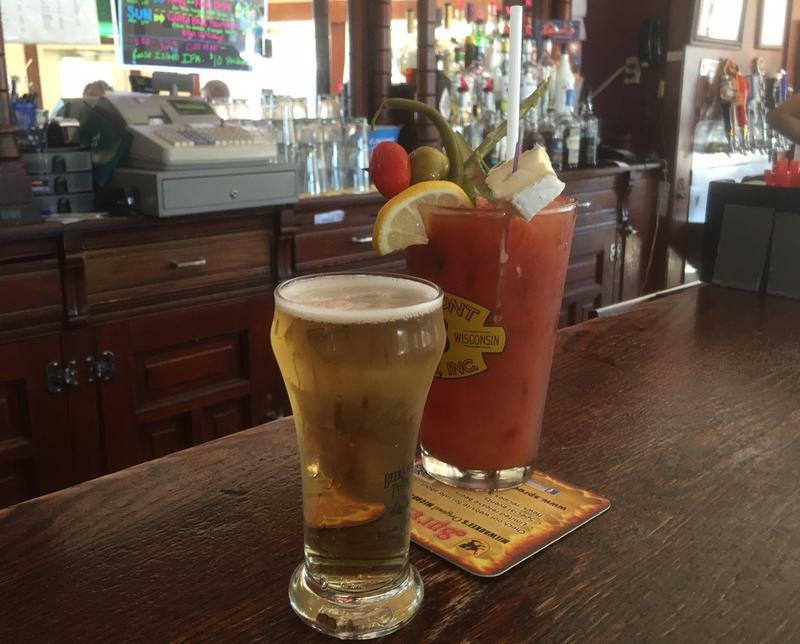 Garnishes in Milwaukee may include asparagus spears, jumbo shrimp, even a piece of brisket or a miniature hamburger. What have you always wanted to know about Milwaukee and the region? For this week's Bubbler Talk, WUWM tackles this question submitted by Hannah Kaytonah: Is Walker’s Point really a ‘gay’ neighborhood?